Which kinds of fabrics should you look for? Why is this question even important? 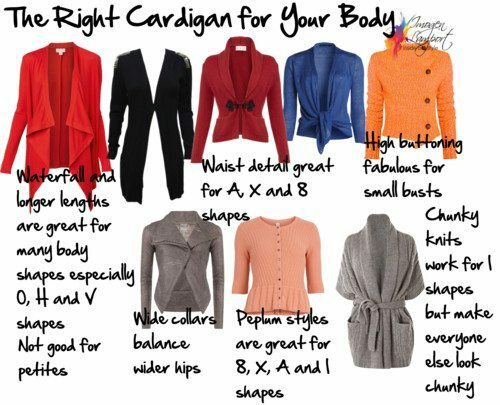 Doesn’t it just matter that the style suits your body shape? Sadly the answer is that you need to take into consideration both the drape of the fabric and the style – this is why people will often tell me that a certain style doesn’t suit them, even though the guidelines say they should. 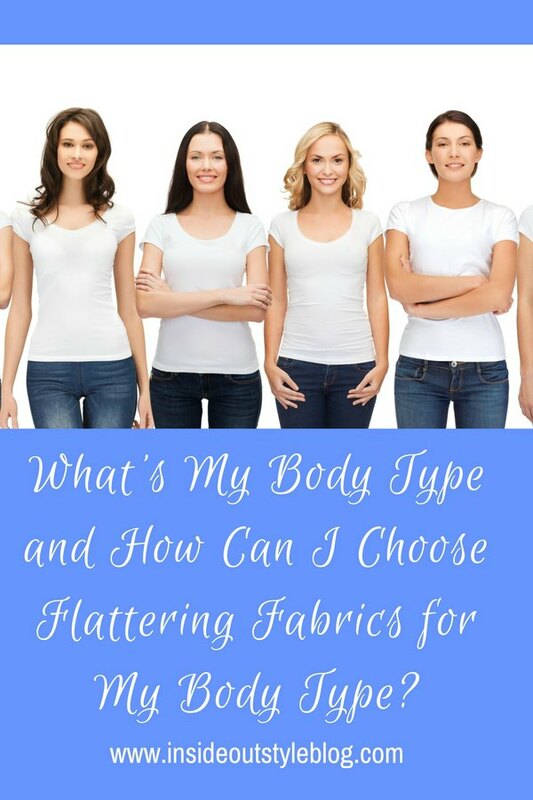 Often it’s because the garment they have tried that was in the recommended style is in the wrong sort of fabric for their body type (or somatotype). 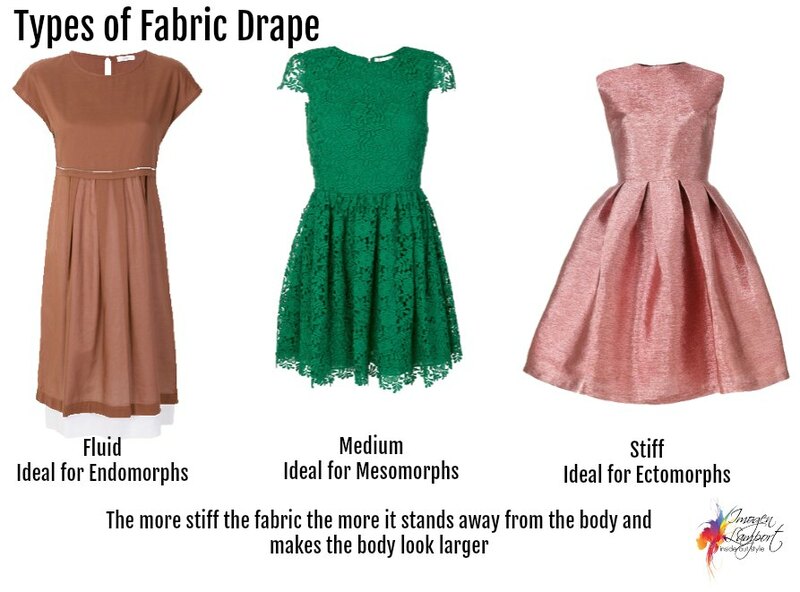 Now choosing the drape of fabric is about body type, (or somatotype – that’s Greek for body type) – ectomorph, mesomorph, endomorph, and this is not necessarily obvious from apparance, but from ‘feel’. Someone who is skeletal (ectomorph) needs a stiffer more structured fabric, because if you put them in a highly drapey/floppy fabric like chiffon, it makes the jutting bones appear more prominent. The stiffer fabric will stand away from the body and create more structure and be in harmony with their harder frame. On an ectomorph, a very fluid fabric will look floppy and without substance. If you are more muscular (mesomorph) – you need some stiffness, and some drape in your fabrics – denim is often a favourite fabric for the muscular type (there is a firmness to the flesh when pressed with an open palm on the tops of thighs and tops of arms). Here is an example of the same body type (muscular mesomorph Michelle Bridges) in a stiff fabric – that works well (left) and then in a fluid fabric kaftan (right) that looks floppy and well, just plain wrong on her hard and musculr body. Someone who is cushioned (endomorph) has a kind of squidgy feel when pressed, and needs a fabric with more drape – now drape is not about the thick or thiness of the fabric, but of the way the fabric falls, so they need clothes that drape more closely to the body, skimming without clinging to create the best silhouette (the cushioned person often finds jeans very hard to buy and they don’t find them comfortable to wear for long periods). Even with a frill, a softer, fluid fabric frill will fall closer to the body and create less bulk. A stiffer fabric will stand out from the body and work well for someone who is naturally very slim or has a harder body. Many people are a combination of body types – so maybe ectomorph on top and mesomorph on the bottom etc. It’s common in people who run (work out their thighs but not upper body so much). Therefore, need to look for different drape fabrics for top and bottom, or split the difference and go for a medium drape all over. Want to know more about what suits your body? All those details that go into a garment that are right for you? You get my professional opinion on your body shape and colouring as part of my 7 Steps to Style program – the most complete and comprehensive style program that is designed to assist you in really understanding what works for you and your unique personality and body. Next articleFabric Choices – Should I Choose Matte, Sheen or Shine? Honey, that photo is not an endomorph; you’d have to find a plus model (and many of those are mesomorphs) to get the cushy built-for-comfort (not “fat”) that is our type. I’m not sure about this “system”. An ectomorph can look fabulous in Rick Ownens’ draping,for example. Strict tailoring in a somewhat stiff fabric can flatter an endomorph, e.g., YSL “le smoking”. How the clothing looks depends on fit and quality of the garment, regardless of body type. LOL! Yes, I have a kind of squidgy feel when pressed in certain places but I am also muscley in bits. So I am a meso/endo? duchesse: I know the model is not an endomorph, though you don’t have to be big to be an endomorph, it’s how the flesh is arranged over the bones – but I’ll look out some plus size models for you. YSL le Smoking is not an overley stiff fabric – it still has drape which it works on an endomorph body. 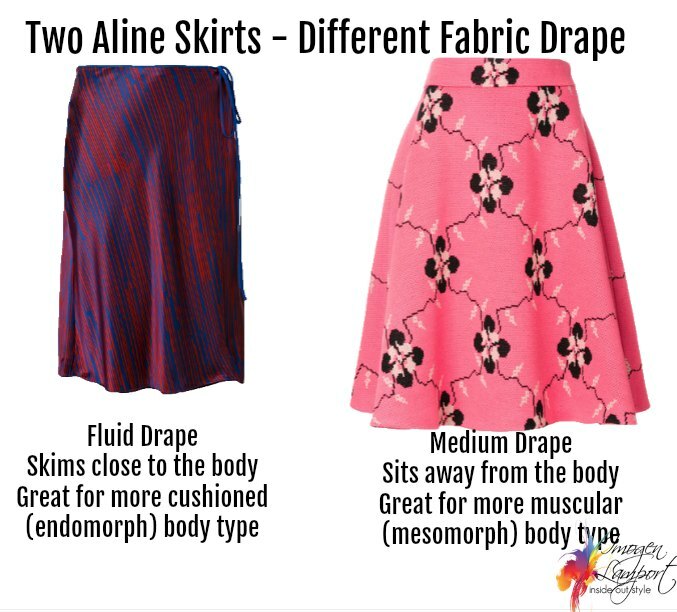 Endomorphs can still have structure, but it’s the drape of the fabric (along with the cut of course) that either falls smoothly over the body or stands away from the body (which is less flattering for an Endo body). La Belette – you probably are a combo body – it’s pretty normal. IMogen, Oh crap. Now I have to cancel my post about silk jersey as the miracle fabric! Karen, Silk jersey is a great fabric for an awful lot of people – so go ahead with your post. I think the gal in grey taffetta looks stunning. Very feminine and can carry that really well. I was staying with my daughter recently who is soft and cuddly; same shape as this buxom beauty & maybe a tad bigger (16). Everyone was busy doing something trendy so I was cruising through pictures of woman and came across this luscious figure in boxy clothes then in sloppy trackies and then wow! in figure hugging, shapely feminine clothes. I said to her, honey, read this. She glanced at it and said nothing. The next day sloppy trackies were trashed and she came out wearing a beautiful, draped day dress. She’s IS an hour glass and never loses her waist no matter how big she gets on top and in the hips. I said to her wow, you look great in that dress. She kept it on all day till hubby came home and he grabbed her for a few luscious kisses…. it was a while before they surfaced for dinner. I’m thinking even hubbies know instinctively what materials look good on their women! 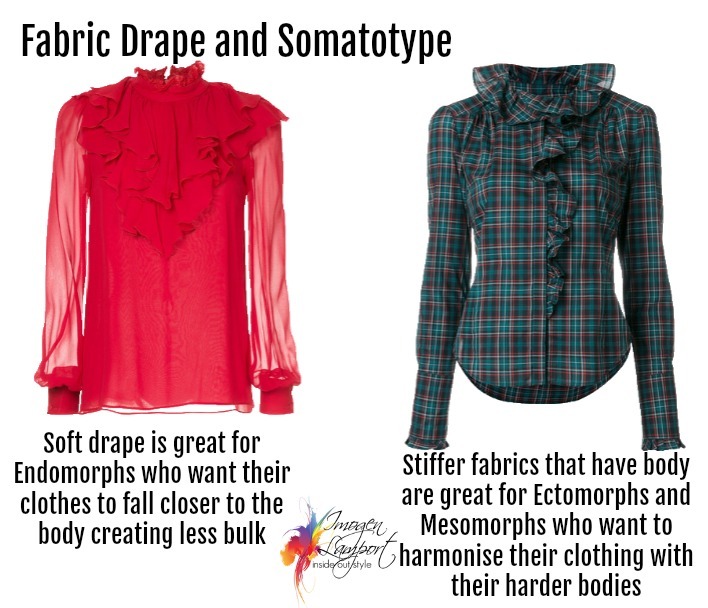 In this post you are saying that stiffer fabrics are better for meso and especially ectomorphs. However, in other post you said that fluid fabrics are better for X body shapes. I’m ecto-mesomorph with X body type. Which one should I follow? You may find that medium drapes is the best for you -neither really stiff nor really fluid. In general more X shapes are endo, but not all! So you have to take the recommendations that work for you and leave the rest. Ah, I see! Thank you for your reply! I really love reading your blog posts.